You are in search of suitable corporate gifts for the upcoming conference meeting? 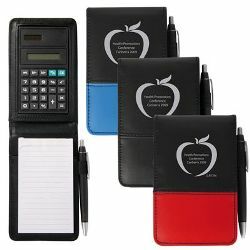 A very practical suggestion for you is a notepad with calculator and pen. Customers will find it easy to put all in a small bag or pocket, taking them to anywhere they want. When never they want to jot down something, here they have the pads and pens, then need to calculate something, the calculator is here already! Leave customers with logos and messages to enhance your business image with WA PRINTING service once taking such wonderful combinations out for usage. For more details about the products, make a call to our offices in Perth and Midland. ITEM SIZE(MM) 111L x 151H x 20D.